Whatever reason you may have why you are using Twitter polls, the guide below will surely help you gain more active engagement and greater exposure. Twitter users these days generally employ polls whenever they hope to acquire feedback from clients, assist them in writing dissertations or help them come up with a well-informed decision. Alternatively, you may also search through hashtag “poll” to unveil what other Twitter users out there have already done. Indeed, it will be of big help too if you consider examining varied queries, responses and lengths to uncover what works effectively with your followers. a) Craft distinctive industry statistics. Not to mention, acquiring real-time outcomes from your followers also provides Twitter users the capability to produce thought leadership as well as authentic industry statistics. It is noteworthy that if your industry possesses an active community on Twitter, it helps to adopt polls to come up with absolute industry statistics. b) Consider crafting debates that are especially intended for fun-filled engagements. Relying on your type of business and what product or service you are offering, polls on Twitter could also serve as a wonderful method to break the dullness of regular posts. Since the usual target audience has always been the younger Twitter users at present; people, brands and businesses that thrive on Twitter frequently make use of emojis in the polls they create and this often result to obtaining higher number of votes due to the more appealing images added. It is quite advantageous if you know how to craft amusing and engrossing polls that clearly speak to what your followers is mostly engrossed in, with the aid of utilizing the same language that suits them and your business. Indeed, this could result to wider engagement on your posts through generating a discourse in the tweet that could assist you craft more brand loyalty and sentiment with your audiences- all of these without attempting to sell them anything. c) Consider promoting other content. You might be aware that it is not possible to fasten images to polls; so alternatively, you may try dropping in relevant hashtags and links that are useful in advertising other forms of content. o Obtain the viewpoints of Twitter users on content topics that you have tackled. o This will spark interest and will be prominent in the timeline. o This will stimulate additional topic ideas or discourses hinged on the feedback you attain. In reality, testing some useful guides that are meant to help Twitter users come up with meaningful polls is definitely a wise move. If you aim to have greater exposure and more active engagement, it cannot be denied that testing could assist you attain the greatest impact for the polls that you are currently composing. These days there is no denying that various social media platforms have notably influenced the manner people, brands, businesses and firms live their daily lives and how they operate business. That said, we cannot just ignore how useful social media networks are in bring massive changes in today’s way of life. While other social media users use these social networks and merely focus on the wrong reasons, still the limitless number of favors and opportunities are just too many and irresistible to simply ignore. Of course, all things come with pros and cons. But, the bottom line here is ensuring that your social media use is for better purpose. Twitter is one of the most frequented social media networks nowadays. 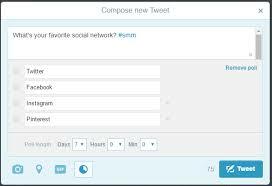 Indeed, one of the most preferred features that users like about it is Twitter poll. This feature allows users to pry into what other users think about a certain topic. As always, it is good to know what people think so you can have more ideas and better make preparations for whatever business you’d like to offer to the public. In reality, polls do not only work for individuals who are solely using them for fun. What is more, the real and meaningful use of polls is having the opportunity to involve others when it comes to decision-making especially if this is about your brand or firm that needs consumers’ opinions for it to thrive. Assuredly, learning more about what your target audiences think about and prefer when it comes to products and services, can tremendously help you plan more about what to minimize or what to add more to make your brand satisfy the needs and preferences of your would-be customers. As you can see, polls aren’t just for fun; these aren’t just for trivial discourses but are mainly formulated to assist business owners and individuals who are seeking for greener pasture to succeed in their ventures, get their followers involved in their decision making and delight in a meaningful engagement with audiences. It is only through this that we can make worthwhile use of social media platforms. Over and above, Twitter is undoubtedly an ideal site to get followers actively engrossed. It certainly comes with vast-reaching range of incomes, living situations, educations and ages. Substantially, it is a platform where to promote profound relationships with followers who already feel a brand connection. More than that, there is a broad spectrum of people globally who provide substantial information regarding social circles, preferences and lifestyle in a voluntary mode. Not to mention, nearly all entrepreneurs wish to believe that he or she possesses the appropriate responses to make the globe a better place. But, the truth is that it is not easy to get people engaged instantly. The key here is to compose highly focused and particularized Twitter polls to absolutely fill in the blanks on vital data regarding your target market. Polls on Twitter can also aid in leading your target market further into your conversion funnel to ensure that they become loyal customers.